The Texas Rangers Heritage Center in Fredericksburg, Texas, from its simple beginning, honors the extraordinary effort, mission, and vision of the Texas Rangers. However, make the Heritage Center a reality wasn't an easy task. It took the mettle of the Rangers, as well as all five character traits they exhibit, to make it happen. The center contains the Ranger Ring of Honor, a memorial to the men and women who gave their all in their service to the people of Texas and the Texas Rangers. Also located at the Heritage Center is the Rangers Tower, a salute to good citizenship and a beacon for learning. The twelve-acre Texas Rangers Heritage Center also consists of several spaces for programs and events. There is an Open-Air Pavilion that seats three hundred and fifty, the LoneStar Stories Campfire Ring, the LoneStar Amphitheater that seats one hundred and fifty, and a full catering kitchen. Coming soon to the Heritage Center's main building is an engaging and immersive exhibit. The exhibit will tell more about the culture, heritage, and history of the Texas Rangers. The center is also the backdrop and focal that supports the LoneStar Ranger Academy. Quite a bit has been written about Texas Rangers, as well as their iconic badge. However, the stories about the Texas Rangers have always been about much more than the story about a Ranger with a badge. It's about the "Story Behind the Badge," as well as the moral character shown by those who wore it in the past and wear the badge today. Those character traits exhibited by the Rangers continue to define some of the best men and women in law enforcement, in addition to those value good citizenship, ethics, and character in the community. Visitors can hear about the rich history of the state of Texas and its Rangers during the LoneStar Campfire Stories in the LoneStar Amphitheater and the Open-Air Pavilion. Guest can also chat with real Texas Rangers to learn more about the traits by which they swear, live, and work. Texas Ranger events allow people to walk along the historic Baron's Creek and view Ranger Re-enactments. Next door is Fort Martin Scott, known as the "Guardian of the Texas Frontier," where visitors can learn about the first fort in Texas. In 2015, the Texas Rangers Heritage Center opened to the public for private events and walking tours. Another opportunity at the Heritage Center is the LoneStar Ranger Program, which offers youth the chance to learn more about the history and principles of the Texas Rangers. Those who complete the LoneStar Ranger Program are awarded with a wall certificate and a one-of-a-kind LoneStar Ranger badge. They also receive free admission to the Texas Rangers Heritage Center, along with free admission for a guest. Youth participating in the program for the Boy Scout or Girl Scouts have the chance to earn a special LoneStar Ranger "Character Award" patch. 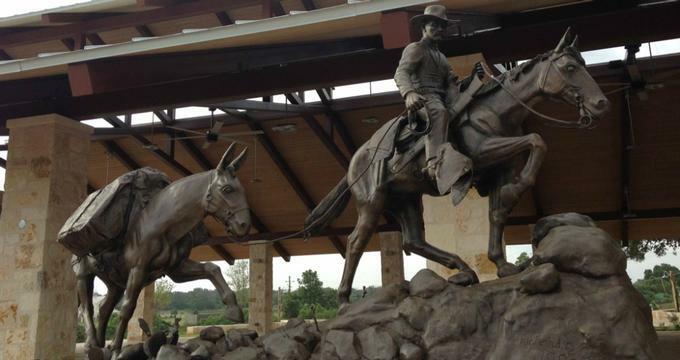 The Texas Rangers Heritage Center offers several opportunities for learning and outdoor adventures for Scout programs.